Our townhome, located at TopNotch Resort, offers renters a first-class experience. Located halfway up 8-mile Mountain Road, you are in an ideal location to take advantage of all Stowe has to offer and also have access to amenities on property that make the trip complete. Our 3 bed, 3 full bath end unit is a really short walk from the spa and TopNotch clubhouse facilities. 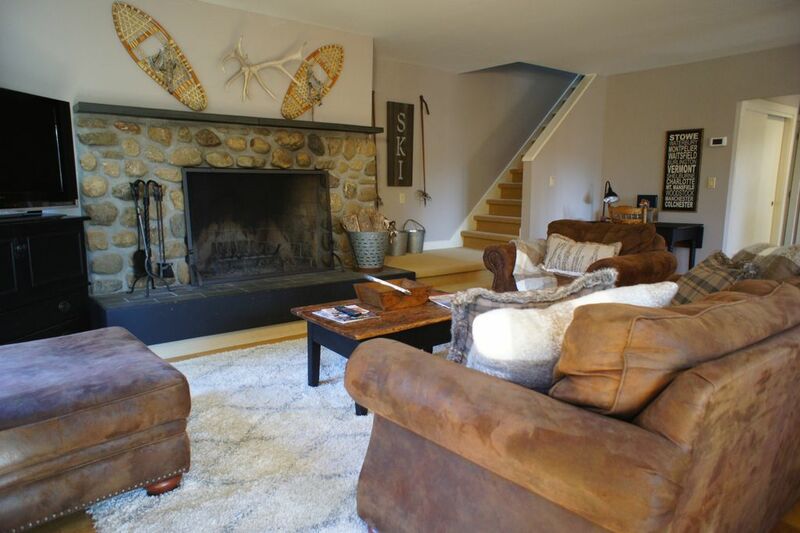 Updated interior with beautiful wood burning fireplace provide the perfect atmosphere for relaxing after a day outdoors. The 3 bedrooms have a king, queen and two twin beds each with on-suite full baths for accommodating 6 adults. We are happy to accept up to 8 people if you bring your air mattress and sleeping bags along for the kids. Mt. Mansfield, one of the premier ski resorts in New England, is three miles away. Renters can access a free shuttle service to the slopes. Outside the gates you can enjoy sleigh rides, cross country skiing and dining and shopping experiences all along Mountain Road. In the summer, Mt. Mansfield ski area offers scenic gondola rides, hiking, mountain biking trails, and outdoor adventure parks. Enjoy Smugglers Notch state park just minutes away. Tennis anyone? TopNotch tennis facilities have been rated #1 in the Northeast by Tennis Magazine. And after enjoying a day outdoors, treat yourself to TopNotch's outdoor heated pool and hot tub at no charge. If you want to pamper yourself, renters may pay a daily rate directly to TopNotch to access their 23,000 sq. ft. spa complete with saunas, steam rooms, whirlpools, hydro-massage hot tub, face and body treatments, massage, and more. Take a swim in their indoor 60-foot indoor lap pool or use their workout facility for aerobics classes, cardiovascular/weight training studios, and more. Contact TopNotch directly to inquire on current rates for daily usage. In the summer, enjoy the outdoor heated pool and hot tub free of charge, as well as their patio bar and dining areas. Choose from two excellent restaurants for your dining needs. Rent corporate meeting space for retreats. You don't need to look any farther than our townhome at Top Notch for a getaway full of entertainment, dining, relaxation and fun. We collect and remit taxes under MRT-10052635. Occum Partners is a two-family partnership based in the Minneapolis MN area. Our families both enjoy the outdoors. Stowe is the perfect place for us to enjoy hiking, skiing, mountain biking, and golfing when we visit New England. We are avid hikers, mountain bikers and outdoor people in general, so Stowe is the perfect place for us to get away and enjoy all we like to do! Enjoy first-class skiing in the winter. Hiking, biking and tennis all outside your door in the summer. Gorgeous scenic drives of fall colors, arts festivals, antique shops and orchards in October. TopNotch is a respected first-class resort that offers newly renovated facilities that include tennis, indoor and outdoor pools, full-service spa, two restaurants, lounge areas and conference meeting facilities. They are located just minutes from Mt. Mansfield, Smugglers Notch state park, and many other local attractions. It is also a short drive into the historic town of Stowe, with restaurants and local shops all along the way. Downtown Stowe is about 5 miles away. It is a historic downtown that is the picture of New England. Catch lunch, stop by the Visitors Center for local info, shop. Nestled in the valley with mountains surrounding on a scenic three-mile drive up to Mt. Mansfield. TopNotch is 3 miles from Mt. Mansfield ski resort. They offer a ski shuttle service on property for guests. TopNotch is 3 miles from Mt Mansfield ski resort. They offer a ski shuttle service on property for guests. Available at TopNotch Spa located about 50 yards from our townhome. Renter must contact TopNotch spa directly and pay fees to them at their daily rate. Kitchen has granite countertops, updated appliances, island seating for 4. Rustic dining table with seating for 6. Their is also a kitchen counter island that seats 4. Free shuttle from resort to Mt. Mansfield. Ski resort is located just 3 miles away. Outdoor pool at Topnotch Resort is available at no charge. Use of indoor amenities must be paid for directly with TopNotch Resort at their going rate. Outdoor hot tub at TopNotch is available at no charge. Fireplace needs a new liner. Smoke upstairs is a significant problem. There is definitely a problem with the fireplace in this unit which results in significant smoke in the upstairs master bedroom. We were not able to sleep in the master bedroom after having a fire in the downstairs living room. The fireplace needs a new liner. This is a health issue. We are sorry if you experienced this issue. It is unfortunate that you did not call our Property manager for assistance when this happened, as opposed to telling us through a review. "This was NOT brought to my attention during any rentals this season. This problem can occur occasionally, but certainly not to the extent the renter is claiming. Many units at TopNotch have dealt have experienced this issue over the years, it has to do with down drafts where the flues converge within the masonry unit. We certainly could have come over and corrected the situation for them had they called." For future piece of mind, the liner does not need to be replaced. The fireplace had been serviced and cleaned prior to winter rentals and everything is in working order. If you are going to ski at Stowe you can't beat the location of TopNotch. I have a large family and staying in a condo is certainly the way to go. The owners were easy to work with and very accommodating. The unit is clean, comfortable and bright. The beds might have been a little too comfortable because my kids didn't want to get up. I would certainly recommend staying here. We appreciate the info you shared and will certainly pass on to our property manager. We have never heard of this problem from previous renters, and we know that the downstairs fireplace gets lots of use all winter. Our property managers contact info is always provided to renters should they have questions or issues. We couldn’t have asked for more! The house was just as pictured; access was easy; firewood was plentiful and the location was ideal! We will absolutely be back! My wife and I stayed with 2 other couples in this unit for a weekend. Each of the 3 bedrooms have their own bathroom which was the main reason we chose the unit. The furnishings are updated and the kitchen is well equipped. Everyone commented that the mattresses were comfortable. The unit was meticulously cleaned. The only negative comment is that the walls between units are thin. We heard a dog barking next door at one point and on the second night I was woken up by voices from the next unit. Overall we were very comfortable and the noise wasn't enough to keep me from staying there again. Large, comfortable and perfect location! Our townhome is located in TopNotch Resort, perfectly located halfway up 8-mile Mountain Road. It was renovated in October 2017 to provide a first-class rental experience. TopNotch Resort offers renters the ideal location and amenities they need to take advantage of all Stowe has to offer. We are only 3 miles from Mt. Mansfield, one of the premier ski resorts in New England. Enjoy a free shuttle service to the slopes. Outside the gates you can enjoy sleigh rides, cross country skiing and numerous restaurants up and down 108. In the summer, Mt. Mansfield ski area offers scenic gondola rides, hiking mountain biking trails, and outdoor adventure parks. Enjoy Smugglers Notch state park just minutes away. And after enjoying a day outdoors, you can treat yourself to TopNotch's 23,000 sq. ft. indoor spa, which offers saunas, steam rooms, whirlpools, hydro-massage hot tub, face and body treatments, massage, and more. Take a swim in their indoor 60-foot indoor lap pool or use their workout facility for aerobics classes, cardiovascular/weight training studios, and more. In the summer, enjoy the outdoor heated pool and hot tub, as well as their patio bar and dining areas. Choose from two excellent restaurants for your dining needs. Rent corporate meeting space for retreats. You don't need to look any farther than our townhome at Top Notch for a complete weekend of entertainment, dining, relaxation and fun.